Netflix announced this morning a new way for consumers to control how much data its app uses when they’re accessing the service by way of a mobile device. In the updated version of the iOS or Android application, there will be a new setting called “Cellular Data Usage,” where you’ll be able to switch off the automatic, default setting then choose either a higher or lower data usage setting, depending on your personal preference. An unlimited data option is also available in this area, which is found under the “App Settings” menu. The company says that by default, Netflix lets users stream around three hours of TV shows and movies per gigabyte of data, which equates to about 600 Kilobits per second. It came up with this setting based on its testing on cellular networks, where it found that this provided a balance between offering good video quality without causing users to go over their data caps or incurring overage fees. 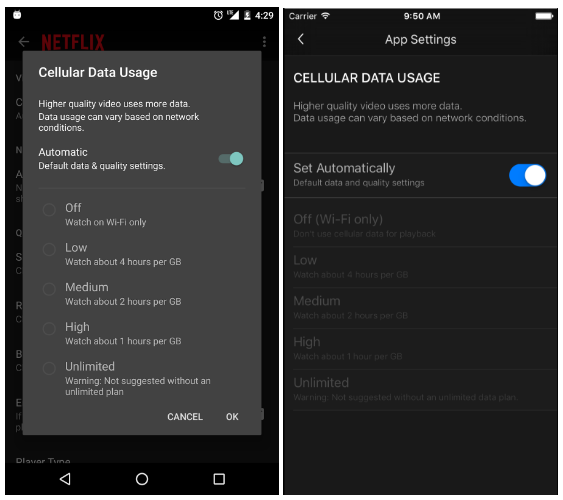 Putting this setting in consumers’ hands is a notable move by Netflix, whose streaming service today accounts for a decent portion of mobile data usage at times. However, it’s not the main source of mobile data when it comes to video. While 70 percent internet traffic is due to Netflix and other streaming services, Sandvine’s end-of-the-year report on internet usage in 2015 puts YouTube at the top of the list when it comes to video services’ consumption of mobile users’ bandwidth. That said, Netflix still made the charts, accounting for 3.44 percent of downstream traffic and 3.22 percent of upstream traffic on mobile networks in North America. (YouTube dominated at around 20 percent for both downstream and upstream traffic, for comparison’s sake). News that a mobile “data saver” feature was in the works was previously announced. The company told press at Mobile World Congress 2016 that it would arrive as a forthcoming update on both the iOS and Android applications sometime this year. The feature was also briefly spotted in the wild, when Netflix’s Android beta testing program was accidentally made publicly visible. This caused some temporary confusion as consumers thought they would be able to test out this and other features ahead of the public launch. Netflix says the new feature is available now in its updated iOS and Android applications and will only be applicable when you’re on a cellular network – the setting won’t come into play when you’re tethered or streaming over Wi-Fi. In light of that comment, it’s worth pointing out that Netflix is already one of the services that’s included in T-Mobile’s Binge On program, where video usage won’t count toward consumers’ data caps. But this puts T-Mobile in charge of the data streams (at 480p), unless consumers opt out.